We look at concepts and products which, for better and worse, were developed in Toronto. Anyone flipping through the classified pages of the March 6, 1919, edition of the Toronto Star might have thought a paragraph bearing the headline “SAVING LIVES” was a pitch for the latest quack cure-all tonic. Those intrigued enough to read further discovered one of the first ads for what became one of Canada’s most trusted cold and cough remedies—even if its flavour is an acquired taste. That’s what Buckley’s White Bronchitis Mixture is doing every day. It is curing Bronchitis, Coughs, Colds, Bronchial Asthma, Hoarseness, when all other remedies failed. I sell it under an iron bound money back guarantee to cure any of the above ailments. No cure no pay. Can I do more than this to prove to you its wonderful healing power? Ten times more powerful than any known cough cure, acts like magic, one dose gives instant relief. Never wait for a cough or cold to wear off. It wears away the lungs instead. Price 50c, 15c extra for mailing. Take no substitute. There is none just as good. Sold only by Buckley, the Druggist, 97 Dundas Street East, Toronto. Left: advertisement for Tamblyn Drug Stores, the Toronto Star, October 13, 1920. Right: advertisement, the Toronto Star, December 2, 1925. 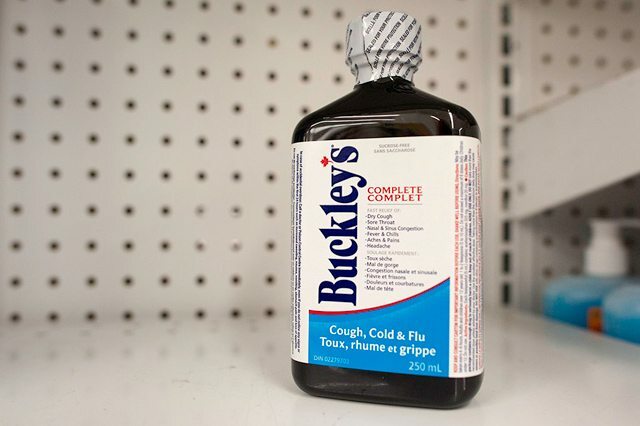 Unlike some competing cold concoctions, Buckley’s was made by a certified pharmacist. William Knapp Buckley moved from his native Nova Scotia to attend the Ontario College of Pharmacy in 1914. He was class president when he graduated the following year. Buckley worked for Eaton’s before opening his own pharmacy at Church and Dundas streets circa 1918 or 1919. 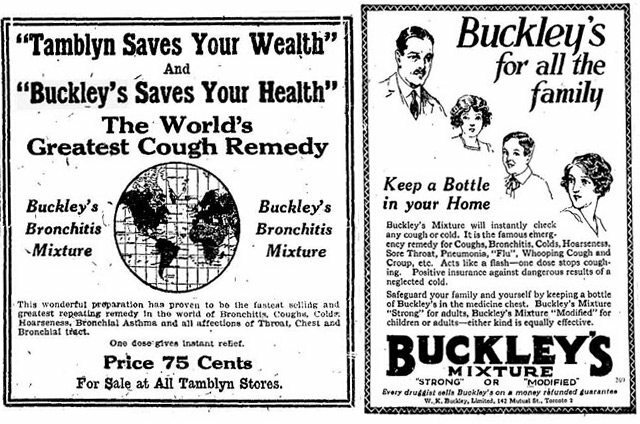 In the wake of the global flu pandemic that hit Toronto around that time, Buckley’s customers sought a stronger cough suppressant than those that were readily available. Buckley devised a mixture of ammonium carbonate, menthol, pine-needle oil, and Irish moss extract. He blended it all in a butter churn. Despite how it tasted, the remedy sold 2,000 bottles in its first year. In March 1920, the pharmacist established W.K. Buckley Ltd., and soon opened a manufacturing facility at 142 Mutual Street. Print and radio ads touted the mixture’s effectiveness (“acts like a flash”) and money-back guarantee. 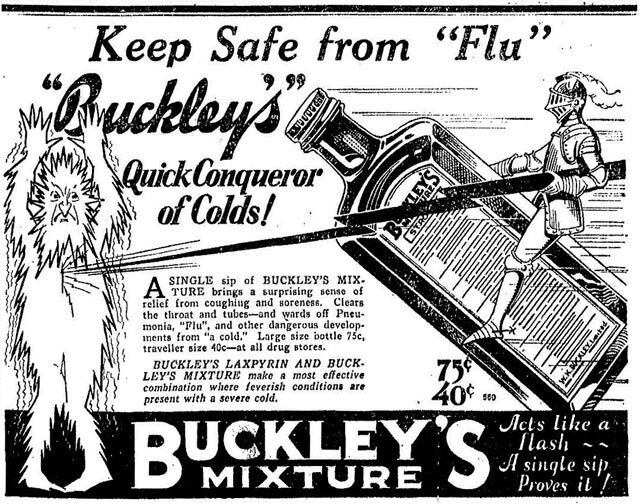 Never mentioned was the taste, which Buckley admitted was “brisk.” The only hint to potential users that taking a spoonful of Buckley’s Mixture was not pleasurable was a suggestion to add an equal amount of honey before downing it. Advertisement, the Toronto Star, January 5, 1929. 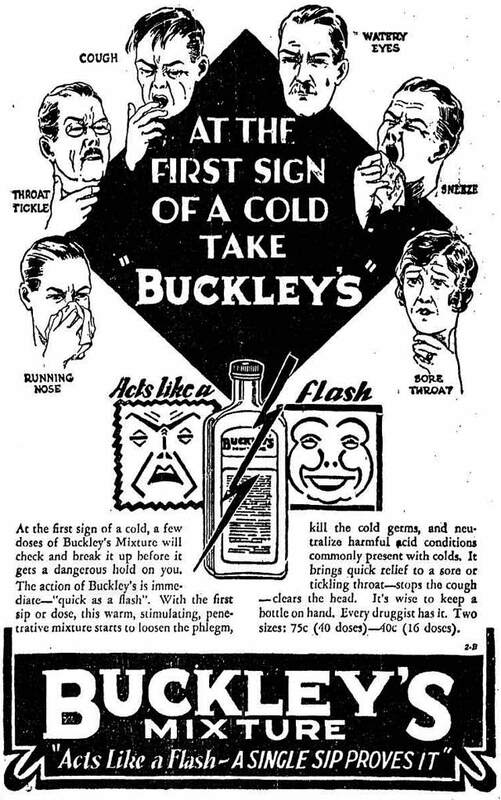 Though his mixture was successful, Buckley continued to run his personal pharmacy and test lab until 1935. Later additions to his line included Buckley’s White Rub, Buckley’s Nezine nasal drops, and Buckley’s Cinnamated Capsules. The original formula remained the company’s top product, though—especially after a smaller, lower-cost bottle was introduced during the Great Depression. Buckley remained in charge of the company until his death in January 1978. He was succeeded by his son Frank, who, aside from being involved in the family business, was an early executive of Global Television and sat as chairman of the Metro Toronto Planning Board during the early 1970s. Frank inherited a stagnant brand with annual sales of $2 million. In 1985, he approved a new ad campaign for the original mixture with the now-famous tagline: “It tastes awful. And it works.” With Frank as the company’s genial spokesperson, annual sales reached $15 million by the dawn of the 21st century. Advertisement, the Toronto Star, March 11, 1931. Additional material from I Know That Name by Mark Kearney and Randy Ray (Toronto: Dundurn, 2002), the February 24, 2001, edition of the National Post, and the March 6, 1919, February 25, 1935, and January 5, 1978, editions of the Toronto Star.